Sevenoaks Sound & Vision to hold Denon 100th anniversary open days | What Hi-Fi? 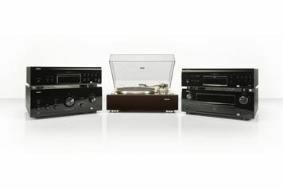 Denon is marking its 100th anniversary in 2010 with the release of the A100 collection of hi-fi and home cinema components, including the DCD-A100 CD/SACD player, PMA-100 stereo amp and DPB-A100 universal Blu-ray player. All Denon A100 components will be on demo in the two stores from 9.30am to 5.30pm, with Denon and Sevenoaks staff on hand to offer help and advice. In the Southampton store, The Chord Company will also be on hand to provide advice on how to get the best out of their high-end cables. • In a separate development, the Award-winning Dynaudio DM 2/6 speakers (Best Buy £300-£600) will now be available through all Sevenoaks and Audio T branches.